So, here’s the thing. I’ve been trying to eat healthy since this whole surgery bit turned my world sideways. But, whoever said that “nothing tastes as good as skinny” has not tasted my mom’s homemade ice cream! If you want to make something fun with the kids this summer, try this favorite that has been enjoyed by 4 generations of my family. P.S. We are making this for our 4th of July family reunion, and I can’t wait to enjoy this bit of culinary perfection in a bowl. Thanks Mom for sharing your recipe with our readers. Bon Appétit y’all! Make the custard the day before you make the ice cream so it can chill well. Mix flour, sugar and salt together. Add beaten egg to the sugar mixture and blend until crumbly. Gradually add milk to the egg mixture and blend well. Cook over medium heat, being careful to stir often so it does not scorch. Cook until the mixture is thick and coats a spoon (DO NOT BOIL). Remove from heat. Chill the mixture in a covered pitcher over night. When you are ready to put in the ice cream freezer: Pour the chilled custard mixture into the can, add all the half & half, the whipping cream, evaporated milk and vanilla. Give the beater a whirl and it will mix all the ingredients together. Freeze according to your ice cream maker’s directions. 1.) 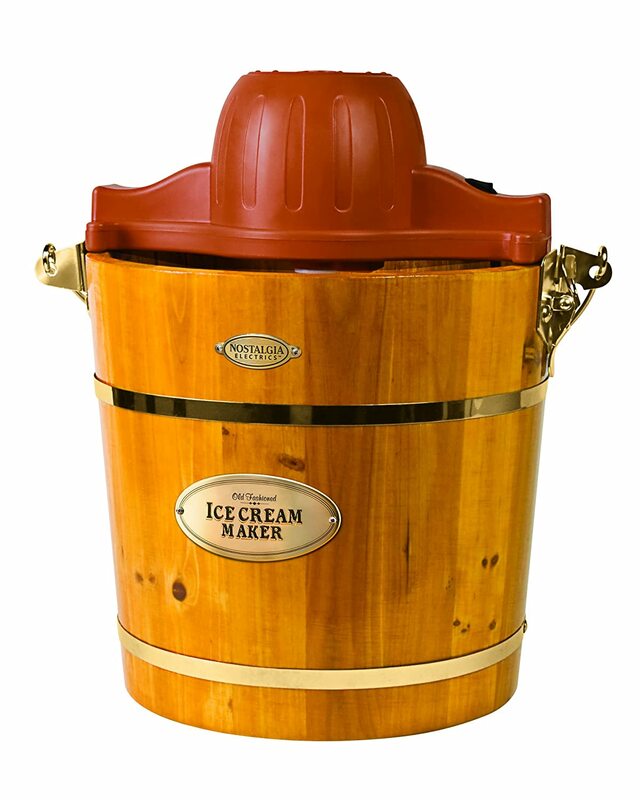 I use a traditional wooden 5-quart electric ice cream maker for our ice cream, but there are lots of great ice cream freezer options to make this process a breeze. We’ve linked to a variety of good ones here. 2.) If you also use a traditional ice cream maker that uses rock/ice cream salt, be generous with the salt on the ice and be sure to avoid letting the salt touch your ice cream or custard (turns perfection to “blech!”). 3.) This is a great starting base for other ice cream flavors. We don’t like to mess with a good thing, but if you are adventurous, you can add fruit, nuts, chocolate chips, or just about any add-in to create other flavors. Do you have a favorite 4th of July recipe or family tradition? We’d love to know about it ~ please share in the comments section below! If you found these savings tips helpful, we’d love to know! site to others with the button below. This entry was posted in Cheap, Cooking and Entertaining, FREE, Recipes, Stretch your Dollar! and tagged Cheap, Dallas, Fort Worth, Ice cream maker, Vanilla Ice Cream Recipe. Bookmark the permalink.